Just like my mum, I too wish I were talking about a date. When I opened the fridge to cook myself dinner last night, things were looking pretty dismal. The only things I had on hand were a particularly wilted half-bunch of shallots, a 59c tin of home brand tomatoes and a teaspoon of vegan ‘chicken-flavoured’ stock. Two cloves of garlic and a handful of fresh basil leaves from my balcony garden later, and I had the makings of a really delicious tomato soup. I topped mine of with a drizzle of olive oil and a shaving of tasty cheese (not a shred of parmesan in sight) and it tasted not unlike a tin of Heinz spaghetti from my youth. In fact, I almost felt like I was eating a deconstructed spaghetti-and-cheese jaffle. Adjust to suit your taste, and add fresh tomatoes if you have any. Ricotta, Parmesan, Mozzarella and Tasty Cheese all work well and give it a new taste every time. 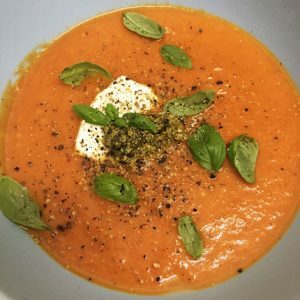 I use a soup maker for the final step rather than an immersion blender on the stove top as it’s super easy (boils AND blends!) and doubles as storage in the fridge. Top with pesto, ricotta and fresh basil. 2. 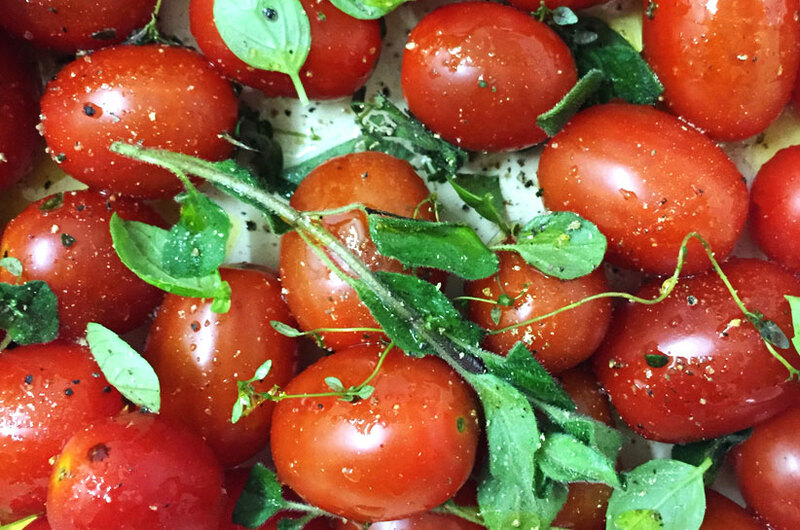 Add Tomatoes, Garlic, Shallots and Basil to a baking tray. 3. Add a pinch of Salt and drizzle with Olive Oil. 4. Bake for about 30 minutes, giving it a stir around the 15-minute mark. It will start to smell incredible – the garlic, onion and basil will make your house smell like an authentic Italian restaurant. 5. Transfer to a large saucepan and add the Stock. Bring to the boil, take it off the heat and blend smooth. 6. Pour into a bowl, add the Cheese and Pepper to taste.